Ohio State solidified its position as the consensus No. 2 team in the county, earning all 16 second-place votes in the weekly USA Today/NWCA Coaches Poll released Tuesday. Penn State, the defending NCAA Champions, was the unanimous first-place team again this week. The Buckeyes opened their dual-meet season hosting a ranked Arizona State team, winning 31-12 on the strength of six individual victories and a forfeit at St. John Arena Sunday. The Sun Devils slipped a spot to No. 12 after losses to Ohio State and No. 4 Michigan. 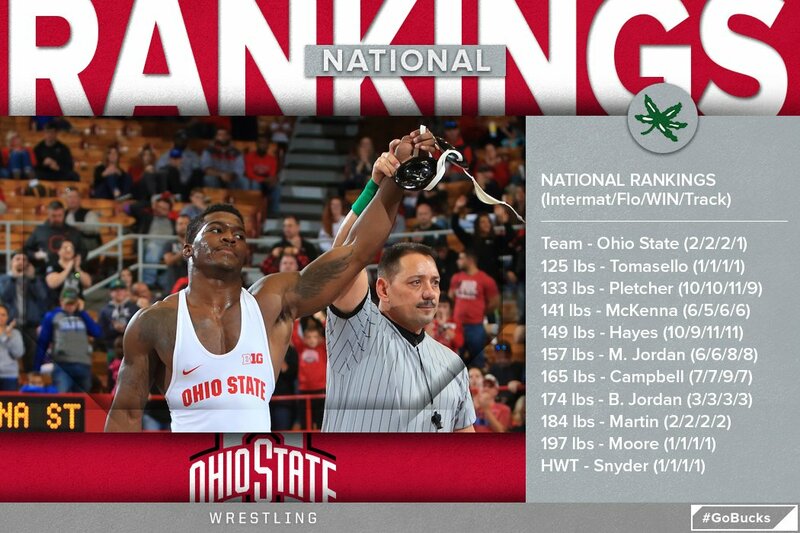 In the updated individual rankings, the Wrestling Bucks mostly held steady, with Nathan Tomasello, Kollin Moore and Kyle Snyder the consensus No. 1 wrestler in their respective weight classes. Bo Jordan maintained his No. 3 ranking after dropping a close decision to the top 174-pound wrestler in the country, Zahid Valencia, and Myles Martin held at No. 2 with his pin over and unranked 184-pound opponent. Micah Jordan, on the other hand, slipped a spot to No. 6 after he was upset by then-No. 12 Josh Shields Sunday. Luke Pletcher and Joey McKenna maintained their positions after wins against unranked opponents, while Ke-Shawn Hayes moved up a spot to No. 10 after his victory over No. 13 Josh Maruca. Te'Shan Campbell had one of the most impressive wins of the weekend, earning a major decision over No. 6 Anthony Valencia. While Campbell held at No. 7 in the various rankings, that had more to do with the strength of the class than with how the outlets viewed the match itself; FloWrestling considered Campbell a nominee for its Wrestler of the Week, an honor that went to Zahid Valencia for his upset of the elder Jordan brother. Iowa (0-0) and NC State (3-0) flip-flopping at No. 7 and No. 8, as the Hawkeyes were idle and the Wolfpack defeated then-No. 18 Oklahoma. The Buckeyes host Iowa Jan. 21 at The Schott. Rutgers (3-0) jumped over Arizona State to No. 11. Ohio State travels to Rutgers Jan. 7. Oklahoma, now 1-2 in former Buckeye assistant Lou Rosselli's second year at the helm, slid one spot to No. 19. Purdue (3-0) jumped into the poll at No. 22. The Boilermakers are coming off a strong 31-6 dual victory over then-No. 22 North Carolina at Saturday’s Journeymen/MyHouse Northeast Duals in Clifton Park, New York. The Buckeyes host Purdue at St. Paris Graham High School Jan. 28. Ohio State hosts Kent State and Cleveland State in the "Thanksgiving Throwdown" tri-dual meet at St. John Arena, Tuesday Nov. 21 at 7 p.m.